Sea Kelp is a natural source of vitamins and minerals but some of them are present at low levels. In this product Bio Health have fortified super quality powdered Sea Kelp with extra B vitamins Thiamin, Riboflavin, Niacin & B6, Biotin, Pantothenic acid, Vitamin C (60mg), Vitamin D (5ug) and natural Vitamin E (10mg), all at 100% RDA resulting in a substantial natural multinutrient complex to contribute toward general good health. Sea Kelp, sourced from the North Atlantic, is rich in the trace mineral Iodine. Iodine is a trace mineral needed to make thyroid hormones, which are necessary for maintaining normal metabolism in all cells of the body. Sea Kelp, Thiamin, Riboflavin, Niacin, B6, B12, Biotin, Pantothenic acid, Vitamin C (60mg), Vitamin D(5ug) and natural Vitamin E (10mg) - capsule: Vegetable hypromellose (HPMC). Take one capsule a day swallowed with water. 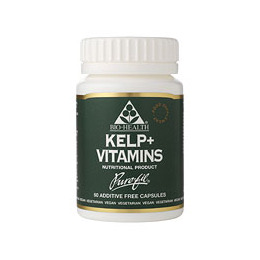 Below are reviews of Sea Kelp - Plus Vitamins - 60 x 500mg Vegicaps by bodykind customers. If you have tried this product we'd love to hear what you think so please leave a review. I have ordered these a few times now and they are marvellous. I have an under active thyroid and each capsule provides me with essential vitamins and that needed boost to get me through the day. I notice the difference when I have run out or forget to take them. Really recommend. Have found these excepionally good ..some presription medication I am on saps all my energy and I’ve found taking kelp helps to counteract this ..so hate to be without them. Excellent product. I have not had a Thyroid since 1992 when it was 'mistakenly' removed. I refused to take Thyroxin and started taking Kelp instead. I still work at 70 and always ensure I take one of these a day before I go to work. I have boundless energy and am 100% healthy all these years on without medication of any sort. These also have vitamins too and are the highest quality and I am so glad I found out about them. Sea Kelp is a natural source of vitamins and minerals but some of them are present at low levels. Bio Health have fortified super quality Sea Kelp with extra vitamins. Sea Kelp naturally contains a rich source of iodine.